The Greeks preferred to drink from small, shallow cups rather than large and deep ones. Chilled fruit juices, milk and honey were enjoyed in the time of Alexander the Great (4th century B.C.). Rites of passage included giving three-year-old children their first jug, from which they had their first taste of wine. Romans drank cider as early as 55 B.C. Beer was available but it was regarded as “not for the sophisticated." It was much more popular in ancient Egypt and Mesopotamia. There was no whiskey or brandy. The distillation of alcohol had not been invented. There was no coffee or tea either. Wine was far and away the main alcoholic drink. It was consumed with meals and at parties, regarded as sources of good conversation and extolled in poems and songs. Grape juice became wine quickly because there was no refrigeration or preservatives in ancient times. 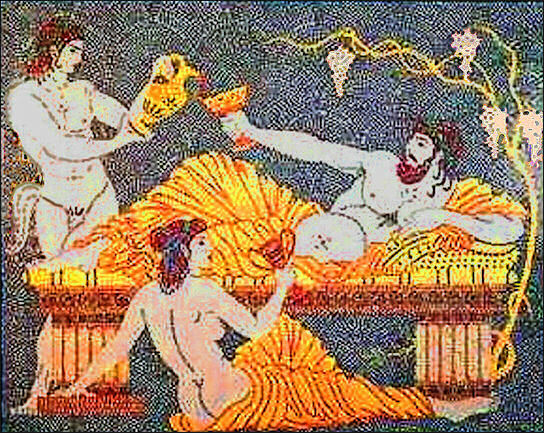 The Greeks drank a lot wine but associated drunkenness with overindulgence and lack of discipline. According to their custom the Greeks mixed five parts water and two parts wine and sometimes added honey and salt water as flavoring. The Greeks believed that drinking undiluted wine could cause blindness, insanity or other terrible things. Later the Franks popularized the custom of drinking wine straight. Men used to hang out at wine shops where strong syrupy wine was poured from an amphorae and diluted with water in a large mixing bowl. Rich Greeks and Romans chilled their wine with snow kept in straw lined pits, even though Hippocrates thought that "drinking out of ice" was unhealthy. The wine from Kos was good and relatively inexpensive. Higher quality wines came from Rhodes. Artemidorus described a drink called melogion which "is more intoxicating than wine" and "made by first boiling some honey with water and then adding a bit of herb." Homer described a drink made from wine, barley meal, honey and goat cheese. Kottoabis is one of the world first known drinking games, A fixture of all-night parties and reportedly even played by Socrates, the game involved flinging the dregs left over from a cup of wine at a target. Usually the participants sat in a circle and tossed their dregs at the basin in the center. “The team analyzed the ratio of the elements strontium and calcium in the bones. Strontium is readily taken up from the soil by plants, but is removed from the body by animals that eat those plants or other animals, Kanz told Live Science. However, a strontium atom will occasionally replace a calcium atom in the bones, so planet eaters and those eating lower in the food chain will have higher levels of strontium, Kanz added. Wine was far and away the main alcoholic drink. It was consumed with meals and at parties, regarded as sources of good conversation and extolled in poems by some of Rome's greatest writers. Ovid wrote: “There, when the wine is set, you will tell me many a tale---how your ship was all but engulfed in the midst of the waters, and how, while hastening home to me, you feared neither hours of unfriendly night nor headlong winds of the south." Grape juice became wine quickly because there was no refrigeration or preservatives in ancient times. 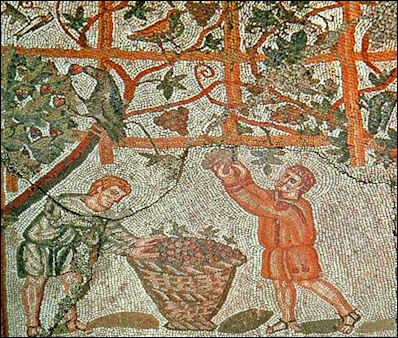 Roman wine tended to be sweet and highly alcoholic because late season grapes were used. Romans followed the Greek custom and diluted their wine with water: the common belief was that only Barbarians would drink it straight. The water content depended on the setting. At family meals water to wine ratio was about 3:1. In taverns there was often little water. The wine was often safer to drink than the water. The acids and the alcoholic curbed the growth of bacteria and other pathogens. Romans believed that wine was a medicine. Roman soldiers were required to drink a liter of wine a day. Families often had it with every meal. The rich took trouble to drink wine in especially beautiful places like gardens when certain flowers were in bloom. Taverns were filled large jug-like amphoras which were filed with wine. By some estimates Rome's 1 million citizens and slaves drank an astonishing average of three liters of wine a day. Although most everyone drank wine diluted with water, people complained if they thought they were being shortchanged. One piece of graffiti found read, “May cheating like this trip you up bartender. You sell water and yourself drink undiluted wine. There were a number of ideas circulated around of how to improve the taste of wine. Pliny the Elder recommended adding “seawater to enliven the smoothness." Cato liked to drink his wine flavored with a drop of pig's blood and a pinch of marble dust. The archaeologist and winemaker Herve Durad told Bloomberg News, “The soldiers didn't care if it turned to vinegar. It gave them energy." Pliny the Elder also wrote that it was common to find drowned mice in wine-filled storage vessels. When this occurred he suggested removing the marinated mouse and roasting it. Estate owners valued their vineyards and inscribed tributes such as “nectar-sweet juices” and “the gift of Bacchus” on their winepresses. Innkeepers inscribed wine lists and prices on the wall of their facilities. Bar in PompeiiHoneyed wine called mulsum was very popular. This sweet Roman drink — a simple mixture of wine and honey — can ne made today by warm a half cup of clear honey and adding it to a bottle of medium-dry white wine. Chill before serving. Massilitanum was a heavy wine that Galen regarded as delightful and good for health but Martial thought was so bad it should only be given to homeless people to poison them. At parties the wine was often sprinkled with euphrosynum (“the plant of cheers”) or hiera botane (“the sacred plant”) to keep the conservation going and keep spirits high. In Egypt, people made wine from raisins and dates. Many of the vineyards in the Moselle Valley in Germany were originally planted by the Romans. Turricuar was a dry white wine the Romans liked to consume with fish and oysters. It was yellowish in color and is spiked with seawater. It tastes slightly of prunes and is made today using a recipe described by Roman agronomist Lucius Columelle. Falernian wine, grown with Aminean grapes on mountain slopes south of present-day Naples, was particularly prized. To improve its flavor the wine was aged in large clay amphorae for a decade or more until it turned a delicate amber color. A liter cost about $110 in today's money. Premium 160-year-old vintages were reserved for the Emperor and served in crystal goblets. Those that could afford it clearly loved to brag about. One tombstone read: “In the grave I lie. Who was once well known as Primus. I lived on Lucrine oysters, often drank Falernian wines. The pleasures of bathing, wine and love gave me over the years." The Mas des Tourelles wine is brownish red and sweet with a taste of preach and caramel candy but it leaves a nasty hangover. Those who tried it described it as a “curiosity” and said “eat a lot of goat cheese and nuts when you---drink it. 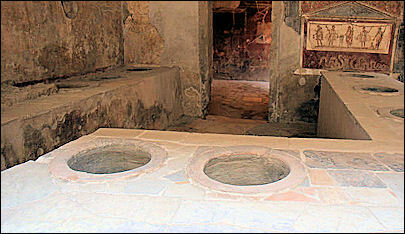 Ancient Roman winemakers used tasting spoons and grape presses, some of which are now displayed in museums. Wine was often stored in 26-liter amphorae which had vineyard name and year labeled on them. Estate owners valued their vineyards and inscribed tributes such as “nectar-sweet juices” and “the gift of Bacchus” on their winepresses. The grapes were usually crushed by foot by slaves, then the mixture was crushed further by a winepress and a stone weight lowered by a tree trunk. The juices flowed down a stem to a waiting pool where it was scooped out and placed in 400-liter clay pots packed with honey, thyme, pepper and other spices. Workers mixed the brew with broomsticks wrapped in fennel. After six days to three weeks in a clay fermentation tub the mixture turned into a foamy red liquid with about 12 percent alcohol. The wine was drinkable for about 10 days before it went bad. collecting grapes in ancient Egypt Grapes contains a lot of sugar. Fermentation caused by the addition of yeast turns toe sugar into alcohol. Yeats is very common, Wild grapes often have some present on their skins, probably transported by wasps or other flying insects. Without distillation, the highest alcohol content is 5 percent for beer and 11 to 12 percent for wine. Above these levels the yeasts lo longer produce fermentation. Stone Age people drank fermented wine by accident and probably made by accident too. The first people who drank alcohol probably eaten a fruit that fell off a tree and naturally fermented. Elephants sometimes get loaded by eating fermented fruit. Grapes sometimes ferment right on the vine. Birds who have gotten so drunk from eating sch grapes they have fallen off their perches. Wine is believed to have been tasted by Paleolithic men who ate grapes with juice that had fermented within the grape skins during years that occurs naturally on the skins. They then might have made wine in containers that had to be drunk quickly, like Beaujolais Nouveau, before it turned to wine. 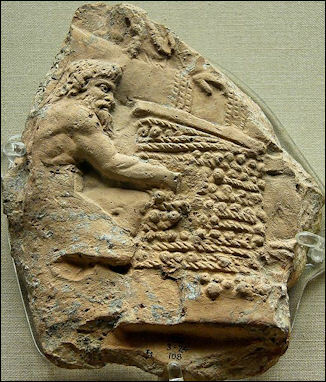 Intentional wine-making is believed to have begun in the Neolithic period (from about 9500 to 6000 B.C.) when communities settled in year-round settlements and began intentionally crushing and fermenting grapes and tending a grape crop year round. This is believed to have first occurred in Transcaucasus, eastern Turkey or northwestern Iran. Around the same time the Chinese were making wines with rice and local plant food. Scholars believe that men may have learned what foods to eat by watching other animals, and through trial and error experimentation. Early man may have discovered early intoxicants and medicines this same way. Winemaking is believed to have been refined through trial and error. One of the biggest hurdles to overcome was manipulating the yeast that turns grape juice into wine and the bacteria that transforms it into vinegar. Many early wines were mixed with pungent tree resins, presumably to help preserve the wine the absence of corks or stoppers. The resin from the ternith tree, a kind of pistachio, was found in wine dated to 5500 B.C. There are a number of myths and stories about the first wine. According to the Greeks it was invented by Dionysus and spread eastward to Persia and India. Noah raised grapes after the flood and became so enamored with his product that he became the first town drunk. In a Persian legend, wine was discovered by a concubine of the legendary King Jamsheed, who suffered from splitting headache and accidently drank from jar with spoiled fruit and fell into a deep sleep and awoke cured and feeling refreshed. Afterwards the king ordered his grape stocks to be used to make wine, which was spread around the world. Book: “Uncorking the Past: The Quest for Wine, Beer, and Other Alcoholic Beverages” and “Ancient Wine: The Search for the Origins of Viniculture” by Patrick E. McGovern (Princeton University Press, 2003). McGovern is an ancient-wine expert and a biomolecular archaeologist at the University of Pennsylvania Museum in Philadelphia. Roman wine-making The earliest evidence of wine making has been found in China: traces of a mixed fermented drink made with rice, honey, and either grapes or Hawthorne fruit found on pottery shards dated to 7,000 B.C. found near the village of Jiahu in Henan Province northern China. Wine has also reportedly been found on a pottery sample from a Chinese tomb dated to 5000 B.C. Analysis by University of Pennsylvania's Museum of Archaeology and Anthropology of the pores of 9000-year-old pottery shards jars unearthed in Jiahu turned up traces of beeswax, a biomarker for honey; tartaric acid, a biomaker for grapes, wine and Chinese hawthorne fruit; and other traces that “strongly suggested” rice. Grapes were not introduced to China from Central Asia until many millennia after 7000 B.C., so it is reasoned the tartaric acid likely comes from hawthorne fruit which is ideal for making wine because it has a high sugar content and can harbor the yeast for fermentation. Wine traces has also been found in a pottery sample from a Chinese tomb dated to 5000 B.C. This findings raises the question: which came first grape wine or rice wine. Grape pips, an indication of possible wine making operations, have been found in six millennium B.C. sites in the Dagestan mountains in the Caucasus. An archaeological site called Hajii Firuz (Firuz Tepe) in the Zagros mountains in Iran with mud brick-buildings dating to 5400-5000 B.C. yielded jars with traces of tartaric acid (a chemical indicator of grapes), calcium tartrate and terebinth resin, which are left behind by dried wine. There were also remains of stoppers which could have been placed in the jars to prevent wine from tuning into vinegar. Based on the colors of the residues, the Neolithic people that lived there enjoyed both red and white wine. The site was identified by a team lead by Patrick McGovern, an ancient-wine expert and a biomolecular archaeologist at the University of Pennsylvania Museum in Philadelphia, in 1996. Ceramic remains unearthed at Godin Tepe in the Zagros Mountains suggest that wine was produced there about 3,500 B.C., pushing back the earliest documented evidence of wine making by about 500 years. The discovery was made by a graduate student at the Royal Ontario Museum who noticed a stain on a vessel she was assembling. When the stain was analyzed it revealed tartaric acid, a substance found abundantly in grapes. If the stain was indeed made from wine it shows that wine-making and writing evolved about the same time. [National Geographic Geographica, March 1992]. Early wine was probably made from the wild Eurasian grape ( Vitis vinifera sylvestris ), which grows wild throughout the temperate Mediterranean, and south, west and central Asia. Later domesticated grapevines---now account for 99 percent of the world's wines--- were developed from wild Eurasian grapevines. Domesticated grapevine are self-pollinating, hermaphroditic plants that yield larger and juicier grapes. Transplanted to irrigated regions where didn't grow before, the Eurasian vines are the source of nearly all modern wine-producing grapes, whether red pinot noirs or white Chardonnay. The first domesticated grapevines are believed to have been developed in the northern Near East, perhaps in Armenia or perhaps in the Zagros mountains of Iran, where wild grapes still grow today and pollen cores show they grew in Neolithic times. By 3000 B.C. domesticated grapes had been transplanted to the Jordan Valley, which became a major exporter of wine. 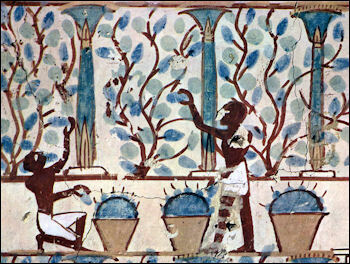 It produced large amounts of wine that was traded to Egypt and elsewhere. An Egyptian King named Scorpion who was buried in 3150 B.C. with 700 jars of imported wine. Between 3000 and 2700 B.C. the Egyptians were marketing wines in amphorae with labels that indicated the year, the contents, where it was produced, the owner of the vineyard and the quality with the best being rated as “very, very good." . Between 3000 and 2500 B.C. winemaking became a major export business in what is now Shiraz in Iran. The Sumerians and other Mesopotamian groups were major buyers. Viticulture arrived in Crete in 2500 B.C. From there it made its way to Greece. A Greek drinking cup from the 6th century B.C. shows the god Dionysus carrying grapes in a ship across the Mediterranean. Between 200 and 100 B.C. General Zhang brought grape cuttings from Central Asia to the Chinese Emperor. “At the group’s vineyard, which should produce 70 litres at the first harvest, modern chemicals will be banned and vines will be planted using wooden Roman tools and will be fastened with canes and broom, as the Romans did. Instead of fermenting in barrels, the wine will be placed in large terracotta pots – traditionally big enough to hold a man – which are buried to the neck in the ground, lined inside with beeswax to make them impermeable and left open during fermentation before being sealed shut with clay or resin. “We will not use fermenting agents, but rely on the fermentation of the grapes themselves, which will make it as hit and miss as it was then – you can call this experimental archaeology,” said researcher Mario Indelicato, who is managing the programme. “The team has faithfully followed tips on wine growing given by Virgil in the Georgics, his poem about agriculture, as well as by Columella, a first century A.D. grower, whose detailed guide to winemaking was relied on until the 17th century. “We have found that Roman techniques were more or less in use in Sicily up until a few decades ago, showing how advanced the Romans were,” said Indelicato. “I discovered a two-pointed hoe at my family house on Mount Etna recently that was identical to one we found during a Roman excavation.” What has changed are the types of grape varieties, which have intermingled over the centuries. “Columella mentions 50 types but we can only speculate on the modern-day equivalents,” said Indelicato, who is planting a local variety, Nerello Mascalese. In 2016, a Roman-ere tavern, still littered with animal bones and the bowls used by patrons, was discovered in Lattara, an important historical site in France,. The tavern was most likely used during 175–75 B.C., around the time the Roman army conquered the area. The tavern served drinks as well as flatbreads, fish, and choice cuts of meat from sheep and cows. In the kitchen, there were three large ovens on one end and millstones for making flour on the other. In the serving area was a large fireplace and reclining seats. “The excavated area includes a courtyard and two large rooms; one was dedicated to cooking and making flour, and the other was likely reserved for serving patrons, the researchers said. There are three large bread ovens on one end of the kitchen, which indicates that “this isn’t just for one family,” but likely an establishment for serving many people, Luley said. On the other side of the kitchen, the researchers found a row of three stone piles, likely bases for a millstone that helped people grind flour, Luley said. “One side, they’re making flour. On the other side, they’re making flatbread,” Luley said. “And they’re also probably using the ovens for other things as well.” For example, the archaeologists found lots of fish bones and scales that someone had cut off during food preparation, Luley added. “The dining room also had “an overrepresentation of drinking bowls,” used for serving wine — more than would typically be seen in a regular house, he said. Next to the two rooms was a courtyard filled with more animal bones and an offering: a buried stone millstone, a drinking bowl and a plate that likely held cuts of meat. “Based upon the evidence presented here, it appears that the courtyard complex … functioned as a space for feeding large numbers of people, well beyond the needs of a single domestic unit or nuclear family,” the researchers wrote in the study. 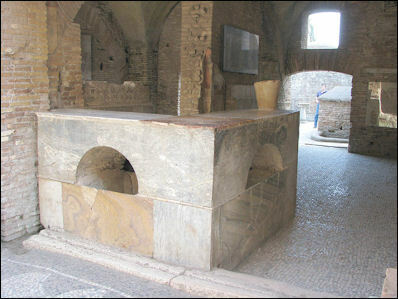 “This is unusual, as large, ‘public’ communal spaces for preparing large amounts of food and eating together are essentially nonexistent in Iron Age Mediterranean France.” Perhaps some of the people of Lattara needed places like the tavern to provide meals for them after the Romans arrived, Luley said. “If they might be, say, working in the fields, they might not be growing their own food themselves,” he said. And though the researchers haven’t found any coins at the tavern yet, “We think that this is a beginning of the monetary economy” at Lattera, Luley said. “The study was published in the journal Antiquity. “Stracathro Fort was at the end of the Gask Ridge, a line of forts and watchtowers stretching from Doune, near Stirling. The system is thought to be the earliest Roman land frontier, built around AD70 – 50 years before Hadrian’s Wall. The fort was discovered from aerial photographs taken in 1957, which showed evidence of defensive towers and protective ditches. A bronze coin and a shard of pottery were found, but until now little more has been known about the site. The archaeologists discovered the settlement and pub using a combination of magnetometry and geophysics without disturbing the site and determined the perimeter of the fort, which faced north-south. “Now archaeologists working on “The Roman Gask Project” have found a settlement outside the fort – including the pub or wine bar. The Roman hostelry had a large square room – the equivalent of a public bar – and fronted on to a paved area, akin to a modern beer garden. The archaeologists also found the spout of a wine jug. Dr Birgitta Hoffmann, co-director of the project, said: “Roman forts south of the Border have civilian settlements that provided everything they needed, from male and female companionship to shops, pubs and bath houses. Ancient Greek Olympic athletes took psychedelic mushrooms for a competitive edge. Cannabis was mentioned by the Greco-Roman era physician Galen. Archaeologists in Israel unearthed remains of a teenage girl with the remains of a fetus in her abdomens dated to the 315 A.D. With the remains was ash containing THC (an active ingredient in cannabis). The archaeologists speculate that maybe cannabis was given to the girl as pain relief. The Greek scholar Theophrastus (371-287 B.C.) wrote about the use of opium poppy juice and mentioned opium in connection with myths of Ceres and Demeter. The founding fathers of medicine, Hippocrates, Galen and Dioscorides, also wrote about opium. Poppies were also pictured on Greek coins, pottery and jewelry, and on Roman statues and tombs (where poppies symbolized a release from a lifetime of pain). Ceramic jugs, dated to 1,500 B.C., shaped like an opium capsules and containing stylized incisions were unearthed in Cyprus and believed to have held opium dissolved in wine that was traded with Egypt. Ivory pipes, over 3,200 years old and thought to have been used for smoking opium, were found in a Cyprus temple. In Greco-Roman times, opium was used in religious rituals, as an ingredient in magic potions and as a painkiller, sedative and sleeping medicine. The potion "to quiet all pain and strife and bring forgetfulness to every ill" taken by Helen of Troy in Homer's Odyssey is believed to have contained opium. Some scholars have suggested that the "vinegar mingled with gall" offered to Christ on the cross contained opium because the Hebrew word for gall ( rôsh ) means opium. Poppies were pictured on Greek coins, pottery and jewelry, and on Roman statues and tombs (where poppies symbolized a release from a lifetime of pain). The Greek scholar Theophrastus (371-287 B.C.) wrote about the use of opium poppy juice and mentioned opium in connection with myths of Ceres and Demeter. Alexander the Great introduced the drug to India and Persia. At the time of Christ opium was widely used. There are numerous accounts of opium cultivation, opium use in medicine and even opium addiction. The founding fathers of medicine, Hippocrates, Galen and Dioscorides, all wrote about opium.Marcus Aurelius took opium to sleep and deal with the stress of prolonged military campaigns. The Romans reportedly used toxic does of opium to poison their enemies. Text Sources: New York Times, Washington Post, Los Angeles Times, Times of London, Yomiuri Shimbun, The Guardian, National Geographic, The New Yorker, Time, Newsweek, Reuters, AP, Lonely Planet Guides, Compton’s Encyclopedia and various books and other publications. Most of the information about Greco-Roman science, geography, medicine, time, sculpture and drama was taken from "The Discoverers" [∞] and "The Creators" [μ]" by Daniel Boorstin. Most of the information about Greek everyday life was taken from a book entitled "Greek and Roman Life" by Ian Jenkins from the British Museum [||].